Reprise 6533. 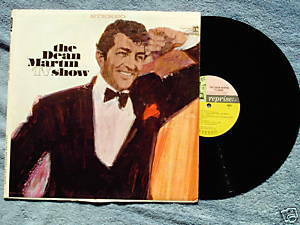 The DEAN MARTIN TV Show: A Selection of the Most Marvelous Melodic Moments from the NBC Series. LP. Tracks include If I Had You, S'posin, Home, What Can I Say After I Say I'm Sorry, It's the Talk of the Town. Orchestra conducted by Les Brown. Ken Lane on piano. Produced by Jimmy Bowen. Liner notes by Stan Cornyn. Vinyl is VG/VG; cover is VG with seam splitting on bottom and pencil check marks on song listing.